let me share the love with you babes! Yehwadam (蘂花譚), The Face Shop's reinterpretation of Korean beauty and traditional herbal beauty recipes, is not something new to me. 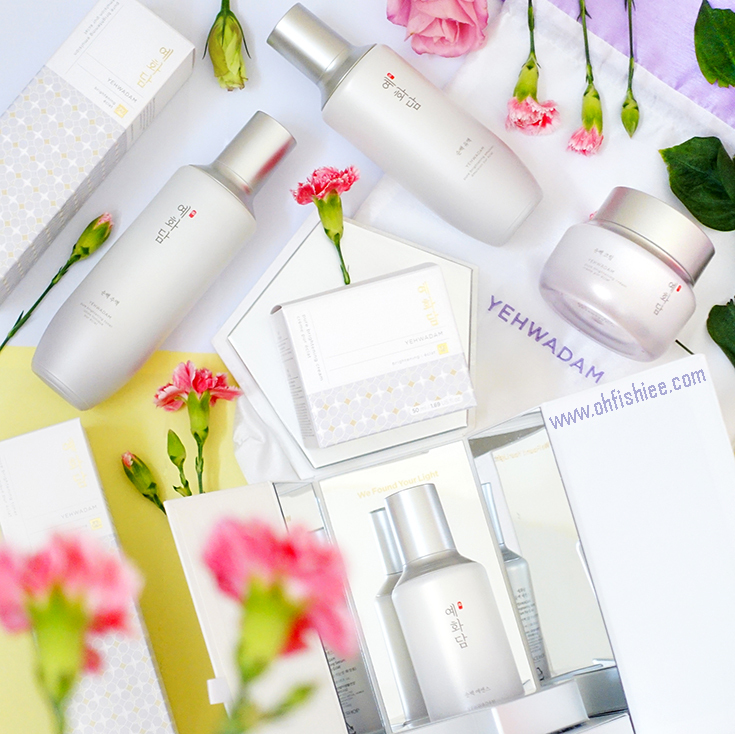 After YEHWADAM revitalising anti-aging series for young skin, now the brand introduces YEHWADAM Pure Brightening specially catered for those who want brighter, more radiant complexion. Wanna reduce the appearance of pigmentations, dark spots and dull skin tone? Yehwadam Pure Brightening is an oriental herbal brightening / whitening anti-aging line that restores skin radiance. As days go by, we'll eventually feel that our skin is losing its clear and transparent features. If you find your skin rather dull and lack of radiance, this is the skincare series you should go for. ❤ Without tar colorant and synthetic preservatives. The unique part is, these 7 brightening ingredients are carefully heated in pure water for a long period of time using a method called Baek-ja to eliminate any toxins in the extraction process, resulting in the traditional herbs that are mild to the skin. After cleansing the skin, toner is something that you just can't skip. it is easy to glide directly on skin or using cotton pad. It is well-absorbed into the skin and able to moisturize the skin well while leaving a healthy glow. A very mild, pleasant herbal scent that disappears very quickly during application. It is the star product in Yehwadam Pure Brightening series. A must-buy item! Apply adequate amount over skin and blend thoroughly. Similarly, the soft-shine brightening serum infuses dull skin with moisture and reduces the appearance of dark spots/pigmentation. The serum contains lamellar, a moisturising ingredient that has a similar structure as the skin. The result? Better moisturizing benefits! The clear white serum is very lightweight and leaves a smooth finish onto the skin. No greasiness or unpleasant feeling at all. It gives the skin a softer, shinier complexion. It smells great with some sort of herbal-floral aroma which soothes the soul. When the skin is all prepped up with toner and serum, it's time to apply emulsion to "lock in" the benefits. After your serum, smooth over face and neck using gentle pressing motions to aid absorption. while creating a protective layer similar to skin structure to prevent moisture loss. Very soft and silky, and in fact lighter than the previous step (serum). I find the content not as concentrated as the serum, hence ideal to forming the "protective layer" on the skin. Lastly, the anti-wrinkle and brightening cream is best applied as the last step for maximum absorption. gently massage over entire face. Pat with your palms for better absorption. This creamy, highly-concentrated brightening cream instantly boosts skin's radiance and reduces the signs of aging skin. Thickest among all the 4 steps, but I'd still consider it as lightweight, soft and silky. And it is not the creamy "cream" type of product that we usually see for the last step of skincare. so a small amount will be sufficient (otherwise, it may cause breakouts, depending on skin condition). Slightly richer in traditional herbs scent as compared to the rest of the Pure Brightening products. 2. I love the unique fomula that combines Brightening + Anti-aging formula. Plus, these whitening products do not dry up the skin at all. 3. Must-have items: Yehwadam Pure Brightening Serum and Cream. I tried white seed before this and my pores get bigger and my skin get darker. I want to try this yehwadam but i'm afraid my pores will get bigger and my skin will get darker. I got a sample kit when i bought random stuff at The Face Shop. I dislike any sort of whitening product because i'm a diver. It scares me to use whitening product of any sort that can damage my skin from the dives. I havent tried diving again from the time i bought Yehwadam, so i'll post an update. But so far, been using it under a month and there are visible results as early as now. However, i've had maybe a few breakouts since i used the product. Not sure if its one of the cons, or the breakout is related to my period.